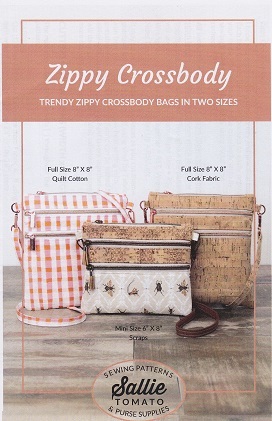 Pretty and practical crossbody bags in two sizes! Each bag features three ziper pockets to easily organize your items! The Zippy Crossbody Bag is perfect size for traveling, shopping, and gifting! Make with quilt weight cotton, vinyl or CORK fabric! Choose to add metal strap connectors if desired for a professional look.